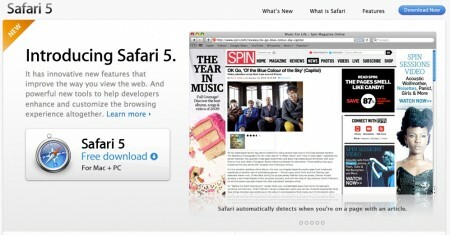 Apple has released Safari 5 yesterday after the WWDC 2010 keynote. The latest edition of Safari include better HTML5 support, Reader, development tools and more. â€¢ Safari Reader: Click on the new Reader icon to view articles on the web in a single, clutter-free page. â€¢ Bing Search Option: New Bing search option for Safari’s Search Field, in addition to Google and Yahoo!. â€¢ Improved HTML5 support: Safari supports over a dozen new HTML5 features, including Geolocation, full screen for HTML5 video, closed captions for HTML5 video, new sectioning elements (article, aside, footer, header, hgroup, nav and section), HTML5 AJAX History, EventSource, WebSocket, HTML5 draggable attribute, HTML5 forms validation, and HTML5 Ruby. â€¢ Safari Developer Tools: A new Timeline Panel in the Web Inspector shows how Safari interacts with a website and identifies areas for optimization. New keyboard shortcuts make it faster to switch between panels. â€¢ Smarter Address Field: The Smart Address Field can now match text against the titles of webpages in History and Bookmarks, as well as any part of their URL. â€¢ Tabs Setting: Automatically open new webpages in tabs instead of in separate windows. â€¢ Hardware Acceleration for Windows: Use the power of the computer’s graphics processor to smoothly display media and effects on PC as well as Mac. â€¢ Search History with Date: A new date indicator in Full History Search shows when webpages were viewed. â€¢ Top Sites/History Button: Switch easily between Top Sites and Full History Search with a new button that appears at the top of each view. â€¢ Private Browsing Icon: A â€œPrivateâ€ icon appears in the Smart Address Field when Private Browsing is on. Click on the icon to turn off Private Browsing. â€¢ DNS Prefetching: Safari looks up the addresses of links on webpages and can load those pages faster. â€¢ Improved Page Caching: Safari can add additional types of webpages to the cache so they load quickly. â€¢ XSS Auditor: Safari can filter potentially malicious scripts used in cross-site scripting (XSS) attacks. Safari 5 is available from Apple’s website or from Software Update. I downloaded it but it doesn’t open any page! AT ALL! But what do you mean by “Extensions” ? I thought Safari already supports extensions, what’s new now? before it was hacks, not supported officially. I did a little search and I found out that the new thing here is that this is “extensions” not “plug-ins”. ! Which makes it familiar to a huge base of developers on the net. Please add a post here to highlight this information.. it’ll be very helpful to others..
you sure you won’t want to be a guest writer here 🙂 ? dear frndz, just visit http://www.mymacbundle.com they got a bundle of eight very nice and useful apps.price only $29.99.